Even the best plumbers in Sacramento need at least a little time to get to you in an emergency. Unfortunately, every passing second means more damage if water is pouring from a broken toilet or burst pipe. You need to shut off the water while you wait for help to arrive. Since every moment matters, it is important to know the location of your water shut off valve. You can save yourself time, money, and headache if you can easily and quickly get to this important valve. The first step is to locate the various valves in your house so you can know which valve to rush to in an emergency. 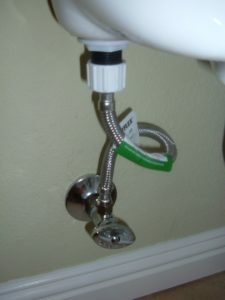 There are likely valves that control water to the entire property, as well as to the individual toilets, sinks, and other features in the house. Note that every home is different, so there is always a chance that yours will not match up with the examples listed here. First is the big one. Somewhere between the street and your water meter is an underground valve (called a curb stop) that controls the flow from the water main to your house. City workers have a special tool that allows them to turn this on or off, so it is not for you to use. There will also be a valve (called a corporation stop) where the main connects to your house line. This is also not for you to use. The valve you should be able to access easily will be near your water meter. This is most likely outside of your home. In areas where freezing is common, the meter may be inside. People do not know Sacramento for its snowstorms. Still, remember that every house is different. Once you find your meter, you should see a main shutoff valve on either side. The one on the side closest to your house is the one you should use if you need to turn off the water. Remember: “Righty-tighty.” Turn it clockwise to close it. You may need to turn it all the way around several times. The solution is easier if your problem involves only a toilet or sink. You may be able to stop the flow with a fixture supply stop. Look under your sink to see a small valve. You may want to experiment. Try tightening it all the way to the right, then turn on the sink. If no water comes out, congratulations! You should also find fixture supply stops behind your toilets, water heaters, washing machines, icemakers, and other appliances that use water. Make a list of where all of the important valves are, tag them so anyone in the family can easily spot them, or draw a map. Whatever you do, be sure you can get to them right away if a plumbing emergency happens. You could save yourself thousands of dollars! 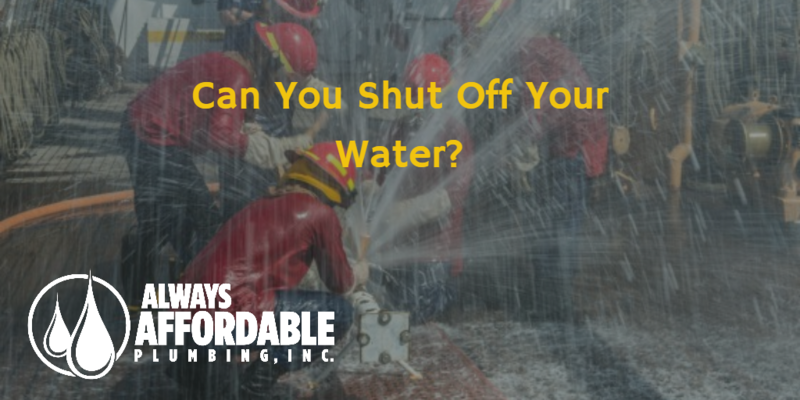 If you have a water emergency, or even just need help finding your shut off valves, CALL ALWAYS AFFORDABLE PLUMBING, 24 hours per day, to have us check it out! Whether you need a FREE Home Plumbing Inspection, emergency 24-hour plumbing services, leak detection, or just need us to replace your water heater, Always Affordable Plumbing is serving Sacramento with the BEST and MOST AFFORDABLE plumbing. Service, quality, and affordability for our customers always comes first. Call today to schedule your appointment!